Phragmites australis is abundant throughout the Great Lakes region. LANSING — Invasive plants can grow so thick and tall they hide the world’s greatest Lakes. “In the lower part of the state it’s pretty bad,” said Laura Bourgeau-Chavez, a research scientist with Michigan Technological University. “We were doing work in Saginaw Bay, and there are kids who live there and they don’t even know there’s water there because the weeds are so tall. Bourgeau-Chavez maps wetlands and monitors them in the field. 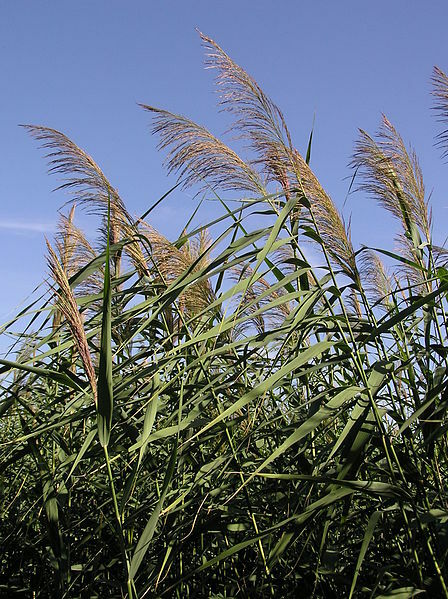 Right now she is focusing on phragmites, a plant with a particularly strong presence in Saginaw Bay, Lake Erie and Lake St. Clair. But the plant has spread elsewhere. Sometimes it is a question of where aren’t there phragmites, she said. Michigan Tech has multiple projects to curtail the spread of species like phragmites and Eurasian watermilfoil, funded by the Michigan Invasive Species Grant Program and the Great Lakes Restoration Initiative. Bourgeau-Chavez heads the phragmites project. Her focus is on removing the nitrogen and debris that are the source of the problem. Attacking the phragmites alone will not eliminate them, she said. That’s not the only plant problem the university is addressing. It is also working with the Les Cheneaux Watershed Council, testing if small doses of a native fungus – Mycoleptodiscus terrestris – will kill Eurasian watermilfoil. Les Cheneaux is a group of 36 islands stretching along 12 miles of Lake Huron’s shoreline along the southeastern tip of the U.P. The watershed council found that the fungus could kill small amounts of watermilfoil. It is a matter of common interest, said Robert Smith, president of the watershed council. Colin Brooks, a senior research scientist at Michigan Tech, has used drones for five years to help the Department of Transportation inspect bridges. His background, however, is in ecology and he’s wanted to combine the two. “We’re able to lift up aerial cameras and also, as far as I know, unique to my project, we’re putting up multi-spectral cameras,” Brooks said. That allows them to collect multiple bands of light that help distinguish watermilfoil from other submerged vegetation. This means Brooks can map the location of the invasion and study how different control methods curtail the plant. If the drones help identify which control methods work best and help researchers understand why, “we may be able to use less herbicide and more native organisms to control milfoil,” he said. Since the lake level has risen, watermilfoil has not been as dense, Smith said. But three years ago it was so thick boats couldn’t move through some of the Les Cheneaux bays. “It’s a matter of when it returns,” Smith said. It’s important not to wait for the worst of the watermilfoil to return, Smith said, because it will be harder to combat, and native species will be vulnerable to the more aggressive watermilfoil. 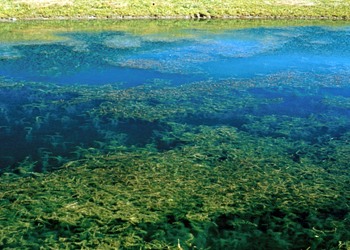 The result could be a lake with only Eurasian watermilfoil. “When you lose diversity, you lose resiliency of the prior ecosystem to respond to stresses,” Smith said. The projects are still in their beginning stages, and Bourgeau-Chavez said Michigan Tech will continue to observe and combat invasive plants over the next year before it reassesses the projects and their effectiveness. LANSING — Down a narrow rural road in southwestern Michigan, an empty corner has neatly mowed grass and two tiny rolling hills. The mounds would likely go unnoticed if not for a small historical marker that most drivers pass without slowing.